November 18, 2018. Tokyo, Japan – This morning the sky was overcast, but, being a Sunday, the roads were relatively clear as His Holiness the Dalai Lama drove out of Tokyo to Ishihara in Chiba Prefecture. He was to inaugurate a new Buddhist centre, the Sherab Kyetsel Ling Institute. Mongolian and Tibetan musicians played in greeting as he arrived and he was offered the traditional Tibetan welcome of ‘chema changpu’. He watered a newly planted sapling in the garden before taking his seat in the house, where he was offered a mandala and the threefold representation of the Buddha’s body, speech and mind. Stepping outside again, His Holiness was escorted to a temple in the form of a Mongolian tent, a ‘gur’. He undid a knotted plait of ‘katags’ and pushed open the doors to signify its inauguration and was joined by other monks in reciting verses of auspiciousness. Inside he lit a butter lamp before a gleaming statue of the Buddha. Once His Holiness was seated, four young schoolgirls stepped forward, smiling, to offer him silk scarves. 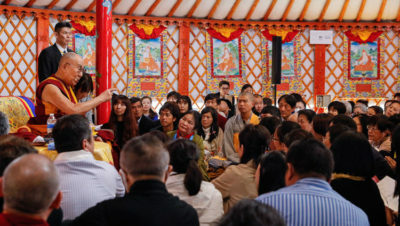 “I’ve never given a teaching in a felt tent like this before,” His Holiness announced, “but I have a feeling that when the 3rd Dalai Lama went to Mongolia to spread the teachings of the Buddha and Je Tsongkhapa he would have done and much later the 13th Dalai Lama would have done too. “In the past, there were strong connections between Tibet and Mongolia and boundaries were unclear. Buddhism first arrived in Mongolia via the Silk Road and was reinforced when Drogön Chögyal Phagpa became the teacher of Kubilai Khan and his descendants. Later, the 3rd Dalai Lama, Sonam Gyatso, was invited to teach in Mongolia, where he received the title Dalai from Altan Khan. His Holiness asked for a show of hands to see how many people in attendance were from Inner Mongolia—about 12—and how many were from Outer Mongolia—about 15. Since most of the rest of the audience were Japanese, what His Holiness had to say was thoroughly translated into Japanese. 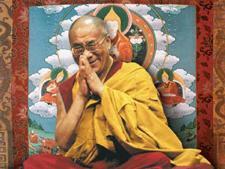 “The 13th Dalai Lama went to Mongolia in 1904 and could speak Mongolian well. Ngodup Tsognyi told me that when he received Bhikshu ordination from him, there is a part of the ceremony that involves pulling up the pleats of the lower robe. He didn’t know what to do and at that point his Tibetan was not good enough to understand the instructions so the 13th Dalai Lama explained to him in Mongolian. “At one time there were thousands of Mongolian students in Drepung Gomang and Sera Je Monasteries. They were all students of philosophy; none of them were involved in menial disciplinary or administrative roles. In 1959, the Abbot of Gomang was Sogpo Lekden and the Abbot of Gyumey was Sesshin Ka. Among other scholars was the Vinaya Abbot Thubten Nyima. Even at that point there were still many Mongolian scholars among us. One of my companions for the Lharampa Geshe exam was Sogpo Yeshi. Another Mongolian, Ngawang Gendun was reputed for his mastery of the classic texts, but Sogpo Yeshi was renowned for his ability to explain them. “These were the last Mongolian scholars to have come to Tibet. Between 1936 and 1939 the Great Repression took place in Mongolia at the instance of Choibalsan. At least 18,000 monks were killed, while others were forced to disrobe and some were recruited into the army. This was the situation Gyen Ngawang Lekden and Thubten Nyima fled. They wore fleece gowns inside out and hid among the sheep during the day and moved on at night. “Sogpo Lobsang was ultimately able to escape to India. He was known for playing mah-jong with the Lhasa aristocrats. It’s said that when the Mongolian students in the great monasteries were hard up, Sogpo Lobsang would go into Lhasa to play mah-jong and bring them back his winnings. “During the 13th Dalai Lama’s time there was another Mongolian scholar, Kalkha Denba, who used to lie down with a page of text, read it repeatedly and deeply ponder what it meant. Phurba Chok, the 13th’s tutor told him, “I’ve heard you’re an emanation of Manjushri”, to which he replied, “O no, I’m not, I’m his neighbour”. Unfortunately, the Great Repression put an end to the stream of Mongolian scholars coming to Tibet. “In 1979, when relations between the Soviet Union and China had lapsed, I was able to go to Mongolia for the first time. At that time there was no religious freedom outside, but monks at Gandenthegchinlen Monastery were free to practise inside. They made a Long Life Offering to me and when it came to the mandala offering they chanted with such passion that they and I were in tears. These elderly monks had risked their lives to protect their monastery. Eventually, after the collapse of the Soviet Union, religious freedom was restored. His Holiness explained that there had been custom in Tibet of venerating a set of Indian masters known as the ‘Six Ornaments and the Two Supreme Ones’. It occurred to him that there were key names missing from the list, authors of seminal texts still keenly studied today. To the original eight masters: Nagarjuna, Aryadeva, Asanga, Vasubandhu, Dignaga, Dharmakirti, Gunaprabha and Shakyaprabha, he added nine more: Buddhapalita, Bhavaviveka, Chandrakirti, Shantideva, Shantarakshita, Kamalashila, Arya Vimuktisena, Haribhadra and Atisha. He composed a praise and invocation to them entitled ‘Illuminating the Threefold Faith’ and commissioned a new thangka painting to illustrate it. He added that it was customary in Tibet to study the five major sciences— craftsmanship, logic, grammar, medicine, and ‘inner science’ or Buddhism, as well as the five minor sciences—synonyms, mathematics and astrology, drama and the performing arts, poetry and composition. Key among these skills was the use of logic. In India logic enabled Buddhists and non-Buddhists alike to debate each other’s points of view, much as today it’s their use of reason and logic that allows Tibetan Buddhist scholars to engage in discussions with scientists. If they relied instead on scriptural authority to bolster their case there would be no common ground on which to communicate. His Holiness clarified that the masters of Nalanda examined Buddhist scriptures in the light of logic and identified which could be taken literally and which were provisional and in need of interpretation. In general, the Buddha explained that there is no single, autonomous, independent self. However, there were occasions when, talking to people who were unable to accept or follow such an argument immediately, he seems to have spoken as if there were such a self. The first turning of the wheel of dharma took place in public and is recorded in a commonly accepted account. It dealt with the fundamental teachings of the Four Noble Truths and the Vinaya, or monastic discipline. The second turning of the wheel, the perfection of wisdom teachings, was given to a select rather than a public gathering. In the works of Nagarjuna and the Five Treatises of Maitreya we find arguments asserting that they were indeed the teachings of the Buddha. These teachings are described in terms of scriptural instructions and the realizations that come from acquaintance with them. Therefore, His Holiness stressed, it is through study, reflection and meditation on the import of such teachings that they will be kept alive. The ultimate goal is enlightenment and Nagarjuna makes clear in his Precious Garland how it is to be reached. And wisdom not relying on duality. Turning to Geshe Langri Tangpa’s ‘Eight Verses for Training the Mind’, copies of which had been distributed to the audience, His Holiness explained, “Tibetans showed some interest in Buddhism in 7th century, but took the Nalanda Tradition very seriously after Shantarakshita introduced it in 8th century. This was the early dissemination. Following the assassination of Tri Ralpachen in 9th century, Lang Darma eliminated Buddhism to such an extent that no monks remained in Central Tibet. The country fragmented. “In Ngari, western Tibet, a descendant of Tibet’s royal lineage, Lha Lama Yeshe Ö thought of inviting Atisha, the most reputed Indian scholar of the time, to his kingdom. He was obstructed by the Ladakhi king’s interference. Nevertheless, his nephew, Chang Chub Ö was ultimately able to bring Atisha to Tibet. Dromtonpa was Atisha’s main Tibetan disciple and his three disciples, Potowa, Phuchungwa and Chengawa each preserved a collection of Atisha’s teachings. Potowa maintained the lineage of scriptural tradition which focussed on six texts: ‘The Compendium of Training’ and ‘Guide to the Bodhisattva’s Way of Life’ by Shantideva; the ‘Bodhisattva Grounds’ by Asanga and the ‘Ornament for Mahayana Sutras’ by Maitreya; Aryasura’s ‘Garland of Birth Stories’ and the ‘Collected Sayings of the Buddha’. “Chengawa took care of the oral transmission or stages of the path lineage which dealt with the stages of the spiritual path from that of a beginner up to enlightenment. The lineage of pith instructions that Phuchungwa looked after consisted of short pithy teachings that a disciple could easily put into practice. “Transmission of the texts in the lineage of scriptural tradition was lost in Central Tibet. I received the transmission of Shantideva’s ‘Guide to the Bodhisattva’s Way of Life’ from Khunu Lama Rinpoché, who had received it in Kham. Since then I have revived the remaining texts in the collection and encouraged their study. “The first seven verses of the ‘Eight Verses for Training the Mind’ deal with how to develop compassion and the awakening mind of bodhichitta. The final verse deals with wisdom. The text begins with a reflection on the kindness of sentient beings. For example, the disciplinary structure of the three higher trainings—ethics can only be undertaken in relation to other beings. The occasion was concluded with a robust and moving musical performance related to the mantra ‘Om mani padme hung’ by Tenzin Chögyal singing and playing a ‘dramnyen’ and Mongolians playing drums, the ‘morin khuur’ and singing. His Holiness shared lunch with the guests and organizers before driving back to Tokyo. Tomorrow, he will be speaking at Reitaku University.